The Protestant Orange Order has refused to back new laws to deal with sectarian marches in the North of Ireland, ensuring the controversial Parades Commission will remain in place for at least another marching season. Every year, massive rioting results from one or more anti-Catholic parades being forced through nationalist communities across the North. In July the Orange Order rejected the new system for overseeing sectarian parades which was set up under the terms of this year’s Hillsborough Agreement. 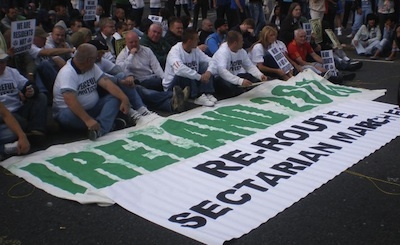 The plans, seen by many as a concession to Orangeism, would have seen the hated Commission, which adjudicates on the routes of contentious parades, replaced by two new bodies which would seek mediated agreements. However on Saturday the Orange Order decided not to change their initial position and declined to submit any recommendations to the legislation. First Minister Peter Robinson said he had therefore decided to abandon the legislative time-frame set down at Hillsborough. He said he was disappointed by the outcome as it would give the Parades Commission “a new lease of life”. “The reappointment of the Parades Commission will sadden many within the Loyal Orders as the Commission has proved to be part of the problem rather than part of the solution to parades disputes”. “I see no advantage in moving from one system which the Orange Order does not engage with to another which, at the present time, does not have its support”, the First Minister added. Commenting this evening, Sinn Fein’s spokesperson on Parades John O’Dowd said the DUP should go progress the legislation rather than “hiding behind” the Orange Order. “The Orange Order rejection of new parades legislation should not be allowed to veto the establishment and endorsement by the Assembly of a new framework to address the issue of parades,” O’Dowd said. “The legislation is an important part of the outworking of the Hillsborough Castle Agreement. The Orange Order were not party to that Agreement and they cannot be afforded a veto over progress to resolve this issue. “The fact that there is a parading issue at all is entirely down to past failures by the Orange Order to reach accommodation on a small number of contentious parades. “They continue to have difficulty with recognition of the community’s right to live free from sectarian harassment. And they continue to have a difficulty with the concepts of dialogue and mediation and code of conduct. “They have a responsibility to play a full part in resolving this important issue. Instead of allowing them a veto on new legislation they should be confronted with their responsibilities with respect to parades in general and contentious parades in particular.